Duke scientists have discovered a potentially interesting way to deliver drugs from an internal medical device, such as a drug-eluting stent. In research published in the journal Advanced Materials, Xuanhe Zhao, assistant professor of mechanical engineering and materials science at Duke’s Pratt School of Engineering, demonstrated that the surface texture of polymers can be altered on demand through application of an electric current. 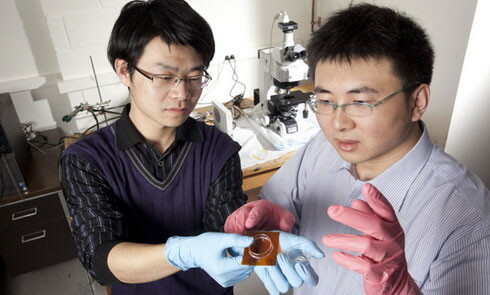 “By changing the voltage applied to the polymer, we can alter the surface from bumpy to smooth and back again,” said Zhao. It had been previously demonstrated that plastics’ surfaces can be permanently textured through electrostatic lithography, in which patterns are “etched” onto a surface from an electrode located above the polymer. In the Duke innovation, the texturing is not done for permanent, or cosmetic purposes, but for short-term, functional purposes. “There are many instances, for example, when you’d want to be able to change at will a surface from one that is rough to slippery and back again.” These include or even as platforms for controlled-release drug-eluting devices. The Duke approach is a more sophisticated way to release drugs from stents than the method currently used. In technology developed at the Massachusetts Institute of Technology, the amounts of sebacic acid used in a polymer compound are varied to determine the rate of release of drugs. Architecture of the polymer also affects drug release rate. The Duke researchers are currently using silicone rubber. “We expect the method will work for many soft polymers (e.g. latex rubbers, acrylic rubbers),” Dr. Zhao tells PlasticsToday. “The voltage currently applied is through a high-voltage supply,” he says. “However, the power required for the actuation is very low, because only electrostatic is involved in the actuation.” A battery with a high-voltage transistor may work. Another potential use of the new technology is creation of surfaces that are self-cleaning and water-repellant. The Duke study was supported by the Research Triangle Materials Research Science and Engineering Center, which is funded by the National Science Foundation, as well as the Lord Foundation and a Haythornthwaite Research Initiation grant. Other members of the research team were Duke’s Mukarram Tahir and Jianfeng Zang.